Virginia State Parks are closing due to Hurricane Florence. Seurat Sunday is CANCELLED for Sept. 16, 2018. 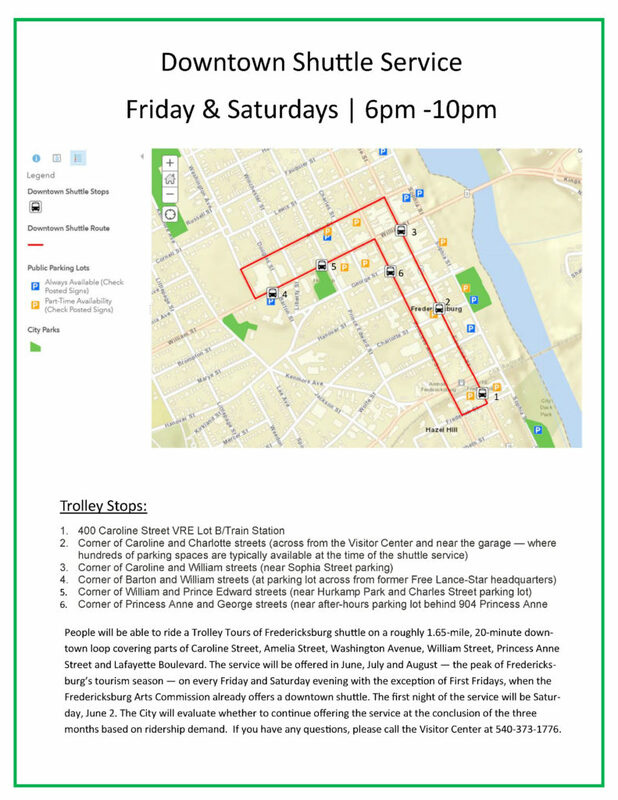 First Friday Trolley is a free public transportation service connecting the network of galleries, restaurants, and other business that host art openings and related events on the first Friday of every month in downtown Fredericksburg. This pilot program with the City and Fredericksburg Trolley will run every Friday and Saturday from 6pm to 10 pm for the months of June, July, and August with 6 stops. It’s that time again – time to select and schedule member shows for FCCA’s Members’ Gallery. All members are invited to submit a portfolio by the deadline, August 22. For 2019, members may request a solo show or a dual show with another member artist. Shows will be scheduled from January through November, 2019, with the annual holiday exhibit in December. The portfolio requirements must include a completed application (DEADLINE EXTENDED TO AUGUST 22) , one original artwork, and four high quality JPG images to be emailed to membersgallery@fccagallery.org. CD submissions, instead of emails, will also be accepted, and all types of media are encouraged. There are no thematic requirements, although entries should best represent your creative style and vision. Check out the FCCA website and follow the Call for Artists link for more information. Come out and support the Youth Art Program! Fredericksburg, Visitors Center. 706 Caroline St.
Children from Hazel Hills & Heritage Park have been working hard over the past year creating many exciting multi-media, 3-D and other art projects under the direction of Adrian Loving & Cathy Ambrose Smith. The young artists will be there as your tour guides for their show. 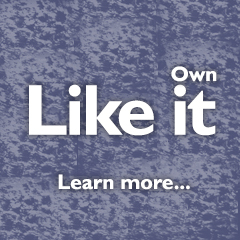 The show will be up all month thru June 29 th, when the Visitor’s Center is open (9 am- 5 pm, Mon-Fri). Please come out and show your support at the opening reception where you can meet all the young artists. In addition to this exhibit, the children also painted a colorful outdoor mural at Dixon Pool! 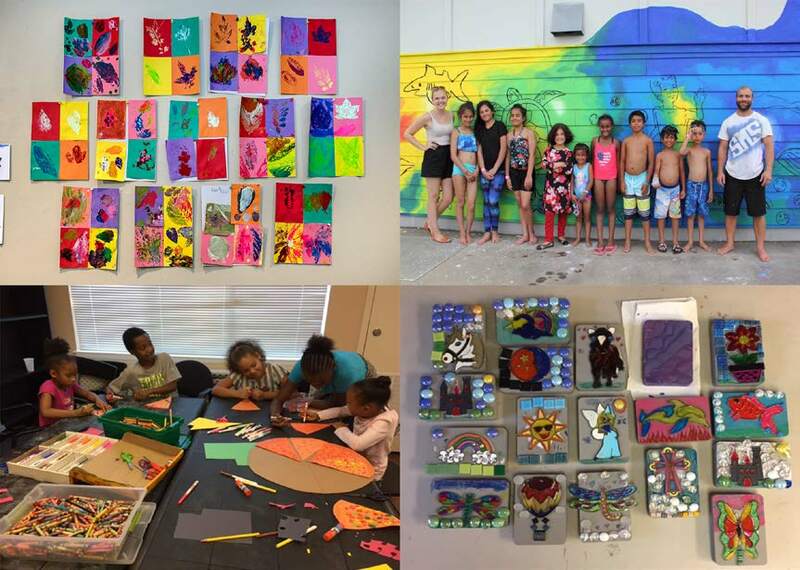 Funding for the Youth Art Program is provided by your donations, a Virginia Commission for the Arts grant and the Fredericksburg Arts Commission. The exhibition can be viewed throughout the month of June during regular Visitor Center hours. Call for entry to all visual artists! The Virginia Museum of Fine Arts Visual Arts Fellowship application will be live this summer 2018, accepting applications for 2019-20 Fellows. The deadline for applications is November 2, 2018 at 5pm! If you are a college bound high school senior, undergraduate student, graduate student, or professional artist, save the date and apply this year to be considered for a Fellowship! Visit vmfa.museum/fellowships for more information on the VMFA Fellowship program and application. If you have any additional questions, please do not hesitate to call or email the Fellowship Office (804-204-2685 or vmfafellowships@vmfa.museum). 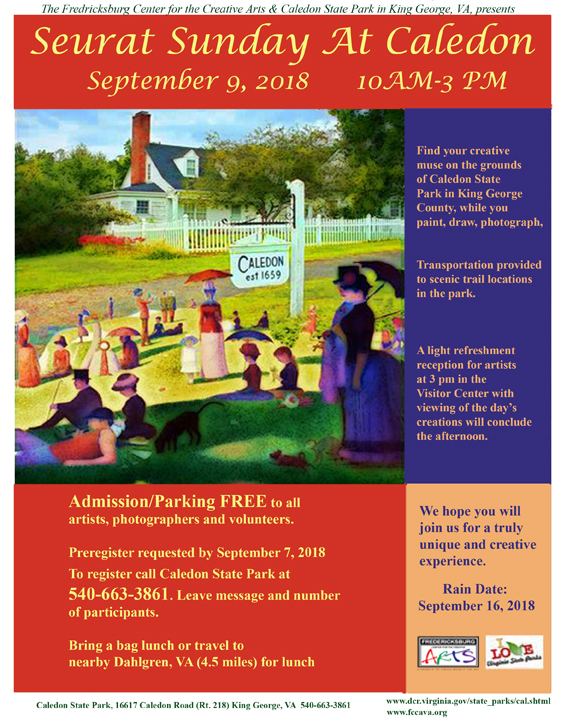 Register at FCCA Docent Desk or call FCCA at 540-373- 5646. Pay by ck./cash/chg. Contact teacher with questions about specific class. Karen Julihn. [FLYER] ART WITH KAREN: Karen Julihn is an award winning artist who has studied painting through VCU, at Art of the Carolinas and currently exhibits her work at Brush Strokes Gallery and FCCA.